One of my all-time favourite guitars is the Epiphone Casino. It is the ultimate Beatle-guitar – all three guitar-playing Beatles have owned and played this model. Paul McCartney still rates the Casino as his personal favourite. 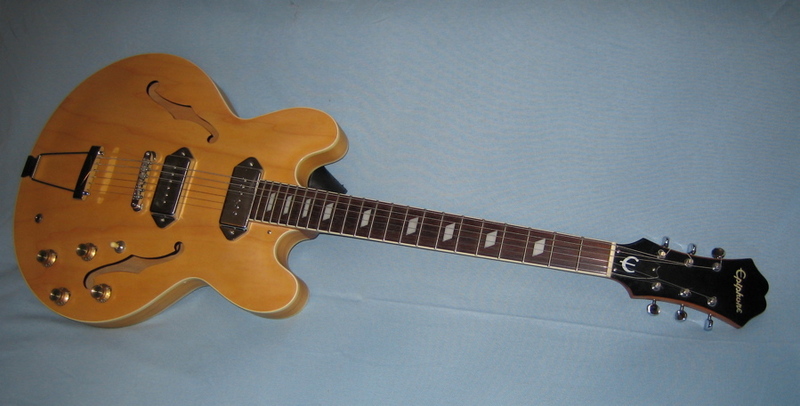 Originally called the Epiphone Casino ES-230TD it was the sister model to Gibson’s ES-330. Gibson had bought (the then US-firm) in the mid 1950s and produced Epiphone models alongside their own line in Kalamazoo (Michigan). Nowadays the Epi brand serves as Gibson’s cost-conscious line and the production has long been moved to the Far East (mostly China). My Casino is an early Noughties Korean-manufactured guitar. Originally a natural (gloss) finished model, it has been Lennon-ised by my friend Sebastian Bunge of Soundhaus Lübeck (Germany). He dulled down the finish (at which point the serial number went missing) and installed higher quality P-90 pickups made by Göldo. 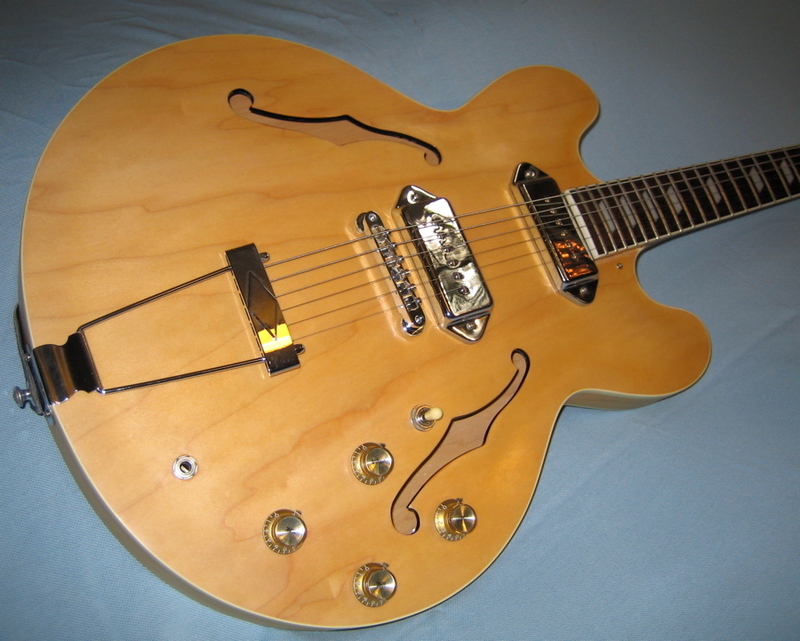 Although the Casino shares the double-cutaway thinline body of Gibson’s ES-335/-345/-355, it is nonetheless a completely hollow bodied model (like the ES-330). There is no maple centre block running the length of the plywood maple body, which is why the neck joint is at the 16th fret. While the originals had one-piece mahogany necks, my guitar comes with a three-piece neck. Basically, the neck is one piece, save for an added bit to make up the height of the neck heel, as well as the headstock, which is joined to the rest north of the saddle/wrist area (not scarf-joined beneath the 2nd fret!). 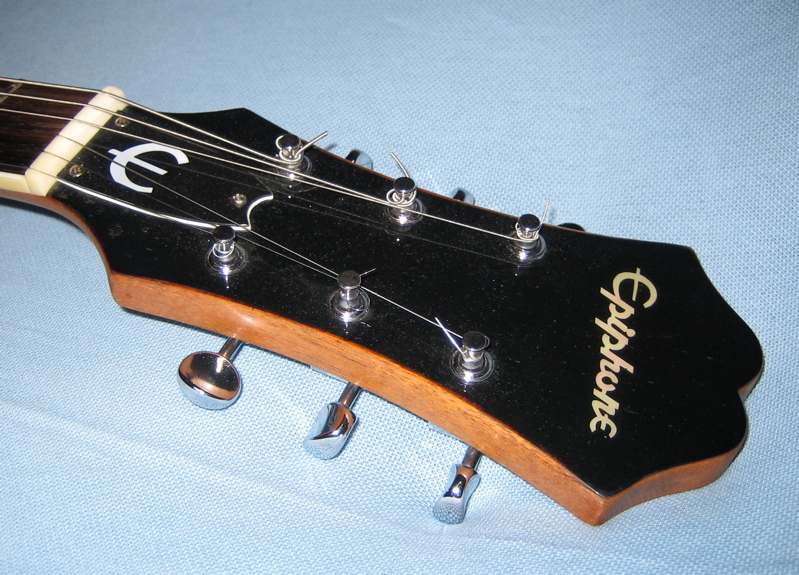 While the first Casinos from the late 1950s/early 60s feature (rather ugly) wide Gibson-type headstocks, all post-65 models come with the much more distinctive Epi-hourglass design. This guitar plays like a dream and sounds like it should. Sebastian pulled it out of its case and said ”I think you might be interested in this!” – damn right I was. He plugged the guitar into a Fender ’65 Deluxe reissue, and it sounded exactly like John on the Apple-building roof in January 1969 (OK, so John had played a Twin…). I love this guitar. One example of myself playing the Epiphone Casino can be found here. This post has been originally posted on my other blog in 2008. 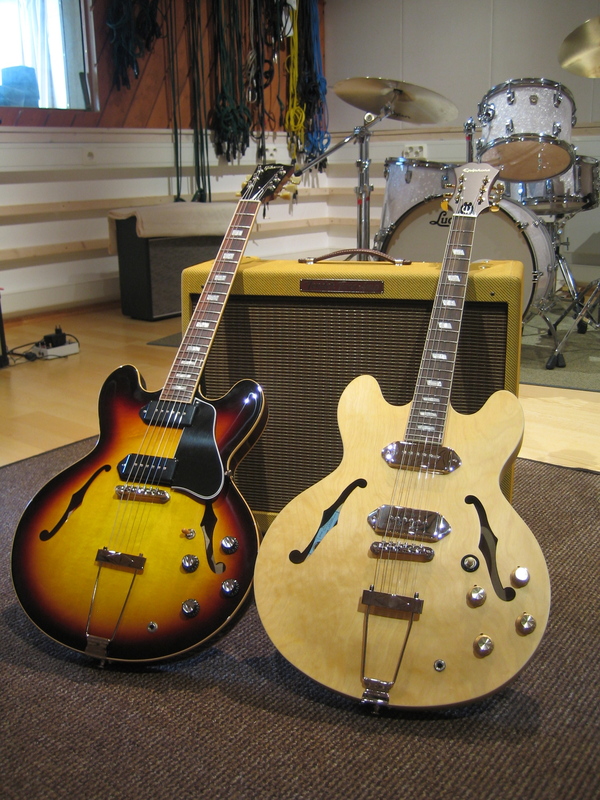 My review of these two beauties – the Gibson ES-330L and the Epiphone Inspired By Revolution Casino – can be found in Riffi Magazine’s issue 4/2010. Reblogged this on Epiphone Casino.